Refinance and renovate loans aren’t as common as other refinance products like a 30-year fixed rate, or adjustable rate mortgage. Even if your lender offers them, you might not be aware of their details. Read on to discover what refinance and renovate loans are all about. What are refinance and renovate loans? Just like they sound, refinance renovation loans are home refinancing loans made for the purpose of taking out equity in the home to use specifically for renovations of that home. There are both conventional refinance and renovation loans, and FHA-backed loans. Each product can come as a fixed or adjustable rate offering. Many refinance and renovate loans require the borrower to have at least 20 percent equity. When does it make sense to consider a refinance and renovation loan? If you have purchased an older home that you are now hoping to improve through the money taken out in a refinancing, then you might be an ideal candidate for a refinance and renovate loan. If you wish to sell your home someday, but right now it requires several important renovations in order to command the selling price you need or desire (or, in extreme cases, in order to sell at all) then refinance and renovation loans might well be worth looking into. If you live in a neighborhood of increasing value while you’re house is flat-lining (in other words: if yours is the worst house in the best neighborhood, so to speak) then you could benefit from a renovation refinance loan. If you have limited home equity, and don’t qualify for other home equity loans like a cash-out refi, these products might be the only way you can refinance, cost-effectively. If you need to renovate, and can assume fewer costs by rolling repairs purchase and refinancing expenses into a single loan. For example: If your home is worth $250,000 and you want to spend $20,000 on repairs, your new loan amount would be $270,000. And you are able to wrap closing costs and fees into the loan. There is one significant advantage to renovation mortgage financing. The advantage is delayed interest. You get six months interest-free before having to pay any interest on the loan. That means for the first six months of the loan, often the most critical for a borrower involved in a home renovation project, you are relieved of making interest payments. Of course, you don’t get away with not paying those six months of interest at all. That amount is simply amortized out into the rest of the loan. There is also one significant drawback of renovation mortgage financing. The drawback is that refinance renovation loans come with higher interest rates than other purchase mortgage and refinance loans. This is to cover the extra risk incurred by the lender for making such a loan. How is the size of the loan calculated? Lenders determine how big of a refinance renovation loan to offer by figuring out the expected value your home will have in the future (or its projected value) upon completion of the renovations. So the renovations you decide on may take some foresight to ensure you’re using this product wisely, and you aren’t overshooting your budget. In many instances,the FHA version of this product may be a more expensive financing option than others. It is increasingly important to consider all other product options that meet your credit qualifying and financial needs before settling on a refinance and renovate loan. As with other types of refinancing products, lenders look for creditworthiness from their borrowers. FHA loans usually require a credit score of 640 or above however FHA is known to be more lenient on debt-to-income ratios than Fannie Mae. Borrowers must also measure up to the loan-to-value (LTV) ratio of their lender. The LTV ratio is determined by dividing the original loan amount by appraised value of the property. Many lenders look for 20 percent equity in a home before offering financing. In order to qualify for a refinance renovation loan, the lender will require you furnish them with the complete architectural blueprints and other plans to your renovation. 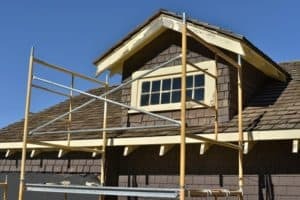 The lenders will use this information to determine if the renovations you play to make to the home justify the size of the renovation refinance loan you’re asking for. The other significant requirement for getting (and keeping) renovation mortgage financing is passing six separate inspections of the home’s progress at various stages of the renovation. The lender will divide up payment to the borrower of the total loan amount into six individual installments. At each stage of the project’s development the lender will need to see acceptable proof that a certain part of the work is completed before the lender will issue the next installment of funds. There are a couple of different home equity products on the market. One home equity loan is a true line of credit. This means that the bank will approve to borrow up to a certain amount of your home, but your equity in the home stands as collateral for the loan. The interest rates are lower than they would be with a credit card. With a refinance and renovate loan, you do not have to put your home as collateral. Another type is a cash-out refi. When a homeowner is able to refinance their mortgage for more than the amount owed, the borrower can take the difference in cash. This is a home equity loan called a cash-out refi. This type of refinancing product requires a loan to value ratio conducive to the payout. A 203K, or a refinance & renovate loan, does not allow the homeowner to cash out. In many cases, with a refinance and renovate loan, the homeowner will be required to hire a contractor, which is different from home equity products. There might also be limits to what you can spend your refinance on. Items like a pool or hot tub aren’t qualifying upgrades. Previous post: Can I Refinance after Bankruptcy?